I know that you have heard about the decline in the honeybee population and the growing problem that this presents to agriculture. Besides providing tasty honey, bees provide a critical service by pollinating at least one-third of our food supply. Growers rely on these bees to pollinate their crops to produce the most abundant harvests. Across the U.S., beekeepers are reporting losses of up to a million colonies of bees. Here in Florida beekeepers manage an estimated 350,000-400,000 working colonies of bees. A single bee colony can contain up to 60,000 bees, including worker bees, drones, and a queen. Each type of bee serves a specific role. The drones mate with the queen to produce new worker bees, and the worker bees perform all of the labor tasks like gathering pollen and nectar from flowers. 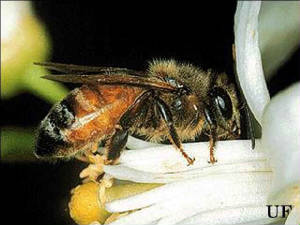 Pesticide use is one of the growing concerns regarding the honey bee population. When foraging bees come into contact with pesticides, those that aren't killed immediately can bring the contaminants back to the hive. In turn, these pesticides can kill larvae and adult bees though contaminated pollen and nectar. By taking careful precautions with pesticides that are used in our landscapes, we can help benefit the health of pollinating bees. The first step is to use pesticides only when necessary. If you must use pesticides, notice if the plant is blooming. Bees are most active at this time, so consider spraying before or after the bloom period. Also, avoid spraying between 8 a.m. and 5 p.m. This is when honey bees are most actively foraging. And finally, try to use pesticides that are less toxic. Neem oil and Organocide are natural pesticides that are not as harmful to bees as synthetic chemical pesticides. Imidacloprid is a common systemic pesticide that is incorporated into all parts of the plant including nectar and pollen. Use systemic pesticides only as a last resort. As gardeners we all need to be aware of the fatal affect pesticide use can have on honey bee populations. The ultimate goal is to have healthy plants and healthy honey bees. Hopefully, by applying some common sense knowledge, we can achieve both. Hurricane season is just around the corner. Check your large trees for damaged branches or large branches close to the roof. If they need pruning, a certified arborist is properly trained in the correct way to prune trees to maintain their structure and health. To find a certified arborist in our area, visit http://www.treesaregood.com/findtreeservices/FindTreeCareService.aspx. 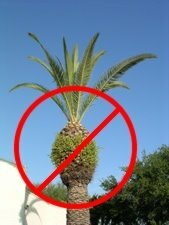 Remember, hurricane pruning of palms where only two or three fronds are left is very damaging and does not protect the palm from wind damage. In fact, palms pruned in this manner are more vulnerable to damage from high winds. As the weather warms harmful lawn and landscape insects become more active. Watch for the early signs of chinch bug damage (especially near the sidewalk and driveway) and treat while the infestation is small. Also look for scale, aphids, mealybugs and whiteflies on ornamental shrubs. Observe if there are also beneficial insects at work taking care of the problem before deciding to treat with a pesticide. 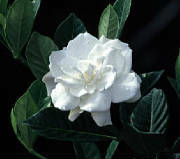 Gardenias should be in full bloom now. If you notice older leaves turning yellow, the cause can be too much or too little water, or fluctuations of temperatures in the spring. If the new leaves are yellowing, there could be an iron deficiency. Use a fertilizer containing Sulphur (to acidify the soil) and iron. An iron foliar spray can also be used. If your Oleanders are looking a bit ragged, Oleander caterpillars could be the culprit. These are the larvae of a rather attractive dark blue moth with polka dots on the wings. If you see the caterpillars on parts of the plant, sometimes just pruning off these parts will take care of the problem. If you need to use a pesticide, Bacillus thuringiensis (Bt) is a microbial insecticide sold under various trade names such as Thuricide or Dipel. Bt is a bacterium that kills only caterpillars. It has no toxicity toward beneficial insects. However, be cautious using Bt near butterfly plants since it can also kill butterfly caterpillars. May is historically very dry, so watch your landscape for signs of water stress. We are only allowed to water one day a week due to the Phase III watering restrictions imposed by the Southwest Water Management District and ELW Water, so be sure that your irrigation system is delivering ¾ to 1 inch of water per zone. If you need to calibrate your irrigation system, refer to the University of Florida/IFAS publication How to Calibrate your Sprinkler System at: http://edis.ifas.ufl.edu/pdffiles/LH/LH02600.pdf. Remember the Pinellas County Fertilizer Ordinance prohibits using fertilizer containing Nitrogen from June 1 to September 30. It is important to fertilize lawn grasses with slow release Nitrogen by May 31 if you have not already done so. Fertilizer with a formula of 15 - 0 - 15 is good to use on lawns. Armadillos, Squirrels, and Bugs, Oh My! Here in the north Pinellas County we seem to have quite an abundance of wild critters and bugs that cause problems in our landscapes. And, if you Google these problems, there are many different "solutions" to solve the problems. I don't have a lot of answers for animal pests, but I do have a few things that you can try. For insect problems, I look to the research done at the University of Florida Institute of Food and Agricultural Sciences. I probably get the most questions about how to control Armadillos. Most of an Armadillos diet consists of insects and their larvae that live in the soil. They also feed on earthworms, scorpions, and spiders. Armadillos forage and root for food by making small cone-shaped holes in the ground mostly at night. Reduce the amount of water and fertilizer you apply to your lawn. A moist lush landscape is perfect for earthworms and insect larvae, an Armadillo's favorite food. Live-trapping. Current Florida law (Florida Fish and Wildlife Conservation Commission Rule 68A-9.010) requires that all animals captured as a "nuisance" either be humanely destroyed or released on the same contiguous property as they are captured to prevent ecological problems or spreading of diseases. There are companies locally who will trap them for you that have permits to remove them or humanely destroy them. The one I liked the best is to switch from sunflower seeds in the feeder to safflower seeds. Apparently safflower seeds do not appeal to squirrels, but the birds like them just fine. As the weather has warmed, the bugs that can be destructive in the landscape have become active. Many of these critters just love the new succulent growth in spring. Aphids are especially fond of new leaves and flower buds. I really believe in scouting the landscape on a weekly basis, looking carefully at all parts of the plants to see if there are any damaging insects. You might want to carry a hand lens to look at some things more closely. Catching these insects when there are only a few of them present makes treating them so much easier. You will also want to look for things like ladybugs and their larvae, green lacewing eggs, or other beneficial insects. They could be feeding on the damaging insects and taking care of the problem for you. If you are interested in learning more about beneficial insects, the University of Florida (UF) factsheet "Beneficial Insects and Mites" can be found on the Internet at: http://edis.ifas.ufl.edu/pdffiles/IN/IN07800.pdf. 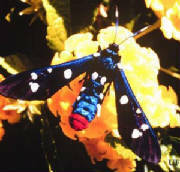 And, the following links will take you to fact sheets with pictures of these beneficial insects. http://edis.ifas.ufl.edu/pdffiles/IN/IN00200.pdf, http://edis.ifas.ufl.edu/pdffiles/IN/IN00300.pdf, http://edis.ifas.ufl.edu/pdffiles/IN/IN01200.pdf. We are all familiar with chinch bugs that can eat through a St. Augustinegrass lawn very quickly. They are a perennial problem and are becoming increasingly resistant to chemical pesticides. To mediate this resistance it is important to rotate insecticides that have different modes of action. Just having a different name does not mean the mode of actions (MOA) are different. Some common products available to homeowners for treating lawn insects along with their MOA are Bayer Advanced 24 Hour (Trichlorfon MOA - 1B), Seven (Carbaryl MOA- 1A), Spectracide Triazicide Once & Done (Lambda-cyhalothrin MOA- 3), Bayer Advanced Power (Cyfluthrin MOA - 3), Scots Lawn Pro Insect Control (Bifenthrin MOA - 3), Bayer Advanced Season Long (Imidicloprid MOA - 4A), and Arena (Clothianidin MOA -4A). You can see from this list that there are several products that you can rotate that have different MOAs. Using and rotating these pesticides might also help reduce Armadillo feeding as well. The UF publication "Southern Chinch Bug Management on St. Augustinegrass" (http://edis.ifas.ufl.edu/lh036) states that it is best to treat just the areas where chinch bugs are found and out about five feet into healthy grass. This also will help with resistance. Cultural practices can be just as important as applying pesticides in controlling chinch bugs and other lawn insects. As stated before, insects usually prefer lush new growth to feed on. Research at UF has shown that St. Augustine grass that is heavily watered and fertilized has greater numbers of chinch bugs feeding and laying eggs. So, spoon feed with slow release fertilizer (it might just help that we have the summer ban on Nitrogen fertilizer here in Pinellas County) and turn off the irrigation each week that it has rained about an inch. Mow your grass at the proper height too. Floratam St. Augustinegrass should be mowed about 3 ½ to 4 inches tall. Some of the other dwarf varieties can be mowed shorter. Proper mowing height insures healthy roots and the overall lawn. Following these practices might also help reduce Armadillo feeding as well. All photos are from UF publications.